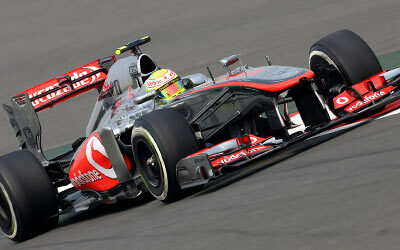 McLaren can be satisfied with their result at Austin as the team managed to secure a double points finish. Sergio Perez kept his starting position to finish 7th while Jenson Button managed to take 10th in the final laps. Sergio Perez, MP4-28A-03, 7th: “On the opening lap, I managed to push past Fernando [Alonso], and the car initially felt pretty strong. After that, however, between about lap 10 and lap 15, the tyre degradation started to kick in, and we struggled relative to the others around us. They seemed to be coping with the [tyre] deg[radation] a little bit better than we were. Jenson Button, MP4-28A-02, 10th: “Even though I was only battling for a single world championship point, I still wanted to do the best job I could this afternoon. “As in all the past few races, I made contact with another car on the first lap – and that contact broke my left-hand front-wing endplate. It wasn’t quite as bad as in Abu Dhabi, but it still left me with quite a lot of understeer. “We considered changing the nose-box at the pit-stop, but, instead, the mechanics added some extra front wing, and that helped to re-balance the car. It still wasn’t ideal, because losing downforce at the front doesn’t affect only the front-end, it affects air-flow across the whole car as well. Martin Whitmarsh, Team principal, Vodafone McLaren Mercedes: “Both Checo and Jenson drove very well in trying circumstances here this afternoon, hampered in their efforts to make significant forward progress by a pit-stop strategy that didn’t quite work out for either of them and a circuit whose layout always makes overtaking extremely difficult. “We opted to put both our drivers on early one-stop strategies, in an attempt to allow them to ‘under-cut’ their nearest rivals, but, as I say, as things turned out we failed to gain any advantage by doing that. “That being the case, Checo drove a solid and controlled race to come home seventh, which was in fact the position from which he’d started the race, further underlining how difficult it was to overtake here today. “Jenson started from P15, owing to a troubled qualifying yesterday, but thereafter drove an excellent race, skillfully nursing a car whose left-hand front-wing endplate had been significantly damaged in a lap-one contact with another car. Despite the understeer handicap that that damage had caused, however, Jenson was able to record some impressive lap-times – and, driving with measured aggression all the while, climbed the leader-board to 10th place at the finish, expertly controlling his tyre wear, and taking a very hard-earned world championship point by pulling off a slick yet spectacular passing manoeuvre on Daniel [Ricciardo] on the race’s penultimate lap. “That move marked a fitting end to a frustrating weekend for Jenson, but I hope he’ll take some comfort from the knowledge that today he equalled our old friend David’s [Coulthard] all-time record of 246 grand prix starts by a British driver. He’ll establish a new benchmark of 247 grand prix starts by a British driver next weekend in Brazil. “Talking of Brazil, which will be the final grand prix of a gruelling 19-race schedule, we’ll now make our way to Sao Paulo as determined as ever to do our utmost to score as many world championship points as we possibly can and thereby consolidate our fifth-place position in the constructors’ world championship. No, finishing fifth isn’t what McLaren is all about, but I want to say a big ‘thank you’ to our mechanics in particular, who have worked very hard and extremely diligently to ensure that our reliability has been first-rate this season even though our relative competitiveness hasn’t.